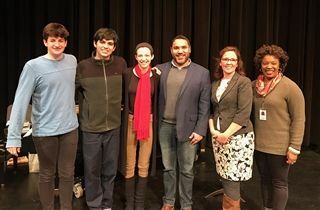 On November 14, upper school singer-actors Macy Brangers, Mason Touma, and Danny Moriarty had the opportunity to sing for Dr. Mark Kano, chair of the Voice Department at Bellarmine University. Each singer sang for fifteen minutes and received feedback on their vocal technique. Macy, Mason, and Danny will all be featured in the upper school spring musical Les Misèrables. Dr. Kano will return in the spring to work with the cast of Les Mis.